This article is not intended to be a comprehensive explanation of airspace. There are exceptions, notably for Alaska and Hawaii, and in areas of terrain higher than 10,000 feet ASL. If you fly in these places, you will need to know the rules, and there are plenty of sources available for you to learn them. The goal here is simplicity. Some airspace is marked for special uses. That is the topic of a separate article. It's a lot easier to understand airspace if you realize there are only two kinds of it: controlled and uncontrolled. 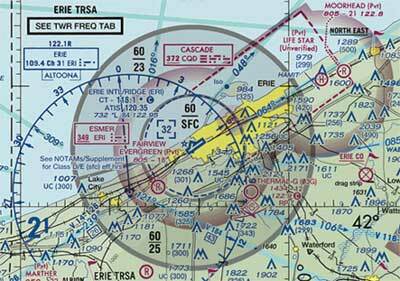 Controlled airspace is where Air Traffic Control keeps IFR aircraft from hitting each other. For the most part, separation for VFR aircraft is not assured, so there are limits on the weather we are allowed to inhabit while using controlled airspace. In uncontrolled airspace, the weather rules are a bit like the Wild West. In controlled airspace, basic VFR weather requirements exist to ensure that pilots can see one another in time to avoid a midair collision. In 1992, the FAA adopted the ICAO system of airspace classification, replacing rules and terminology that had been in use for longer than most pilots could remember. U.S. flying rules were rewritten so that all references were couched in terms of six letter-designated types of airspace. Some familiar concepts didn't fit the new order of things, so the FAA stopped referring to them. But they didn't really abandon the old way; they simply used cumbersome new terminology to refer to old concepts. It's instructive to know some of the simple terms that have been lost, because the concepts are still very much alive. Airport Traffic Area (ATA). If an airport had a control tower, it also had an ATA, a cylinder of airspace with a standard radius and height above the surface. This was not charted except in busy terminal airspace, because the dimensions were known. Pilots had to establish two-way radio communication before entering an ATA. Control Zone (CZ). Arports with certified weather observers and certain radio facilities also had a cylinder of controlled airspace from the surface up. Operations were not allowed in Control Zones under low ceilings. Terminal Radar Service Area (TRSA). If an airport had radar on-site, it had a charted TRSA that showed the regions where terminal radar services were available. Pilots were strongly encouraged to participate, especially if their planes had transponders. Since the U.S. adopted the ICAO standard, there are six classes of airspace, A-E and G (the U.S. does not have class F airspace). G is uncontrolled; the others are all controlled, with different levels of IFR separation services and requirements. This table summarizes ICAO's airspace definitions, services provided, and requirements. It's only here if you're curious – you do not need to know this amount of detail to fly safely and legally in the U.S. national airspace. The U.S. standard is that airspace is controlled, upward from 1200 feet above ground. There are still a few areas where the floor of controlled airspace is higher, but they are few and far between. In basic controlled airspace (class E), there are minimum weather requirements to help ensure that VFR and IFR pilots will be able to see each other in time to avoid collisions. This is especially important in airspace where aircraft radios are not required, which is most of it. Minimum requirements are three miles visibility and standard cloud separation, as shown in the sketch below. In uncontrolled (G) airspace, one mile and clear of cloud is generally good enough, at least in the daytime. As airspace gets more sophisticated, one new requirement is added for each bump. We'll start with with class E, the simplest kind of controlled airspace. At airports with instrument approaches (like Central City, Aurora, and Harvard), IFR aircraft descend in clouds and controlled airspace is lowered to protect them as they get closer to their destination. This is shown on charts by the magenta shading. Controlled airspace starts at 1200 outside the "hard" edge, 700 AGL inside the vignette. Some airports, like Hastings at the lower left, have certified weather observers (could be automated, like ASOS) and minimum radio equipment. At these airports, controlled airspace extends all the way down to the ground. This is shown by enclosing the airspace within a dashed line. The dashed line encloses an area that was formerly called a control zone, class E in this case. Add a control tower, and you get class D. This brings the first additional requirement: you need two-way radio communication to use class D airspace. 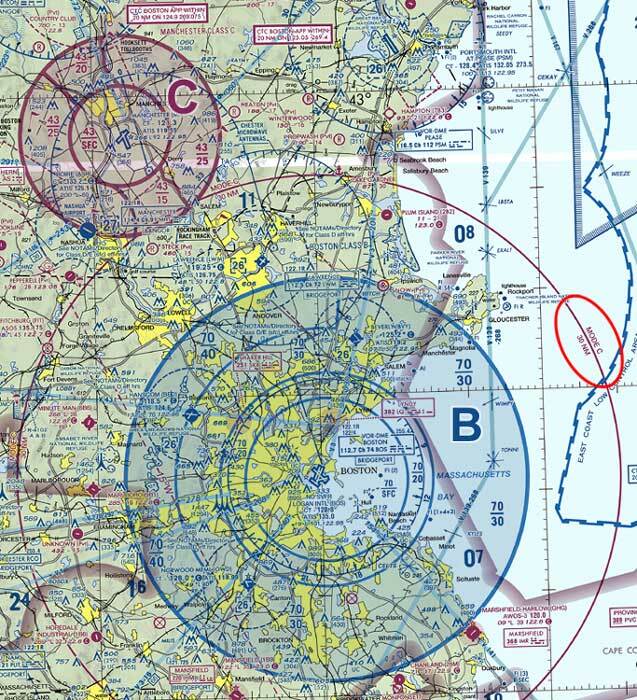 Controlled airspace still begins at the ground, as at Grand Island in the chart snippet. It's class D up to about 2500 AGL, usually class E above that. At Grand Island, there are a couple of class-E extensions to the control zone. You don't have to talk to the control tower there, but you do need standard minimum visibility and cloud separation. At all airports where controlled airspace begins on the ground (dashed lines, of either color), 1000-foot ceiling is also required for VFR operations. Terminal Radar Service Areas (TRSA) exist for some airports that have approach radar available. They are the basis for Class B and C airspace. Radar service is available between the altitudes shown (hundreds of feet), within the areas marked by grey lines. There is a class-D airport at the center of the TRSA. This is the only airspace pilots are required to respect. Participation in the radar service area isn't mandatory, but it's an excellent idea. If you're landing at the airport it serves, the controllers will expect you to call the approach controller first. At airports with more frequent airline service, pilots are required to use radar services, and the airspace is designated as class B or C.
Busier airports have better radar separation services. These airports are at least class C. Because of the radar, you must use an altitude-encoding transponder (mode C) to fly in this airspace. 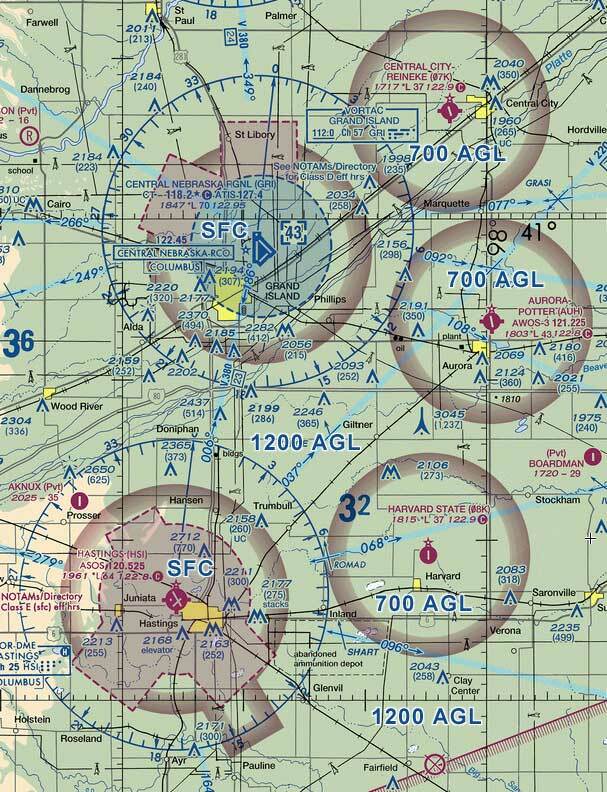 Class C airspace has standard dimensions, extending to 4000 feet above the primary airport: an Inner Circle, with 5 NM radius, and an Outer Circle, 10 NM radius. The Inner Circle is class C all the way to the ground; the Outer Circle has a shelf to allow aircraft without transponders to fly beneath it. It's not shown on the chart, but there is also an Outer Area, 20-NM radius, where class-C services are available. At the busiest airports, such as Boston, even VFR aircraft get IFR-like separation. For this reason, you also need a specific clearance to use class B airspace. Because of the positive separation, cloud clearance is relaxed to "clear-of-cloud." But VFR pilots still need to see three miles. Mode-C requirements are stricter: you need mode C at all altitudes within 30 NM of a class-B primary airport. There's a circle on the chart to remind us of this requirement. One last point about that transponder. The speed limit below 10,000 feet is 250 knots. Above that altitude, you can go as fast as you like, up to the speed of sound. Because this gives less time for pilots to see and avoid one another, the VFR requirements for visibility and cloud separation get stricter. Also, everybody needs mode C to fly at 10,000 feet or higher. In the 1990s, the FAA ran Project Capstone in Alaska. This was an effort to bring better IFR service to pilots in areas with poor or no radar service. Participating pilots had ADS-B equipment, based on GPS. Each plane had ADS-B Out, which broadcast a signal giving its position and altitude. Planes with ADS-B In could generate a display showing nearby traffic. Eventually, the system was refined enough to give reliable IFR separation, a major improvement in a place where it had been unavailable. ADS-B is coming to the rest of us. Beginning in 2020, ADS-B Out will become mandatory in all those places where mode-C is now required. Those who invest in ADS-B In equipment will have the advantage of on-board traffic advisory service, even if ATC is too busy to point that traffic out. At 18,000 feet and up, the airspace is class A. It's simple. Everyone is IFR here, no VFR operations allowed. CoC means C lear o f C louds, for Class-B airspace and uncontrolled airspace near the ground in daytime. The meaning of "1-152" (most daytime class-G) should be easy to figure out. If none of the exceptions apply, stick with 3-152. It seems that every rule has an exception, so this article concludes with three of them. It's possible to have a control tower without class D airspace, and it's possible to have class D airspace without a control tower. At Lake City, Fla. (LCQ)2, the airspace on the runway is uncontrolled, but 14 CFR 91.126(d) still requires pilots to be radio contact within 4 NM and up to 2500 AGL – the old Airport Traffic Area didn't go away, it just got a roundabout definition. Austin Executive, Texas (EDC), also has a control tower in uncontrolled airspace. 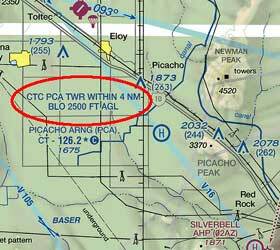 So many pilots ignored the Picacho heliport's ATA about 60 miles southeast of Phoenix, that the chart makers added a special notice to remind us to call the tower when we're in the area. A more common application of 91.126(d) and 91.127(c) is seen for temporary control towers, which don't qualify for class D airspace. These are established by NOTAM for events like the EAA Arlington Fly-In, where a normally quiet airport gets very busy for a few days each year. 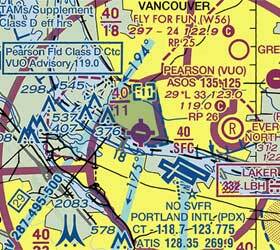 Vancouver, Wash., has the opposite peculiarity – class D airspace, but no control tower. The FAA wants pilots to contact ATC before coming or going because the airport is so close to Portland's main runways, and right on centerline. The local controller will issue a warning about wake turbulence, and then tell the pilot to switch to the CTAF. The class D airspace there extends to the PDX 5-NM inner ring. 1. In the interest of simplicity, this article and the airspace flow chart refer to requirements above 10,000 feet. These requirements also exist at 10,000 feet. 2. 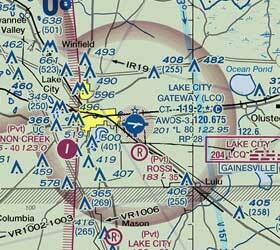 Since this article was written, class D airspace has been designated for Lake City. The example has been retained to show how a towered airport is charted if it's in uncontrolled airspace.